The case involved the extradition trial of a fugitive slave accused of murdering one of his pursuers. The slave, who assumed the name of John Anderson upon his arrival in Canada, had escaped from his Missouri master in 1853. While on the run, John Anderson had an encounter with neighbouring slave owner that resulted in the man being stabbed twice, later succumbing to his wounds. After escaping capture on numerous occasions, John Anderson arrived in Windsor in November 1853. From Windsor he travelled to Chatham and then further east to the small community of Caledonia where he learned the trade of mason and plasterer. In 1858, he was able to buy a house in Caledonia, become a respected member of the community and fade into relative obscurity. In 1860, his quiet, peaceful life was shattered when Brantford authorities arrested him on charges of murder after being tipped off by another fugitive slave who had befriended John Anderson and become his confident. Anderson never attempted to deny the accusation that he had stabbed the Missouri slave owner but insisted that he did so to save his own life and to secure the freedom he always believed he was entitled to. A hearing was held in Brantford to determine if there was sufficient evidence to charge John Anderson with murder under the laws of the Province. There would be no jury at the hearing and the decision of the Magistrate would require final approval by the government. Pending the results of the hearing, John Anderson could be extradited to Missouri under the conditions of the Webster-Ashburton Treaty. 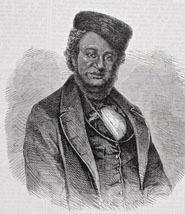 Samuel Freeman, a Bencher of the Law Society, represented John Anderson at this hearing. In the end, the Magistrate determined that sufficient evidence had been presented to charge John Anderson with murder. It was now up to Attorney General John A. MacDonald to decide if John Anderson would be returned to Missouri. After several discussions with Samuel Freeman, MacDonald decided that the matter should go before the judges on a writ of habeas corpus. It was agreed that the case would be heard by the Queen's Bench at the end of the judicial term. John Anderson's case became an overnight sensation and a cause celebre. Abolitionists spoke passionately on public platforms about the evils of slavery and meetings were organized to demand Anderson's freedom and raise a defence fund. In the popular press and in the public mind, John Anderson came to symbolize the oppressed Black in America. It was the opinion of many members of the legal profession and the community at large, that the matter was one of natural rights and justice which no law or treaty could circumscribe. In the words of one supporter, "this attempt on the part of a slave-holding republic to procure the extradition of a man whose only offence was that he had committed homicide in defending his own liberty." The trial began in November 1860 at Osgoode Hall. The defense team led by Samuel Freeman, based its case on the individual's right to break any law that defied the universal principle of freedom and the Crown stated that it had great sympathy for the defendant and that it did not intend to press the case...in the slightest. Feelings ran so high that on the day of the judgement that Osgoode Hall was transformed, for the first time since the Rebellion of 1837, into an armed camp. Police were positioned on the front lawns, bayonets fixed and troops were held ready on Simcoe Street. The foyer, staircase and rotunda of the newly opened centre block were lined with armed guards. Efforts were made to introduce crowd control and to issue tickets to the proceedings. Despite the fears of mob violence, the courtroom and adjacent areas were packed with Anderson supporters, many of them Black. In a well reasoned judgement presented by Chief Justice John Beverley Robinson, the Court of the Queen's Bench decided that under the law, extradition could not be denied. Justice Archibald McLean, a staunch abolitionist, dissented, stating that in "...administering the laws of the British province, I can never feel bound to recognize as law any enactment which can convert into chattels a very large number of the human race." On the announcement of the decision there was outrage but no violence. The Anderson case became an even hotter political issue, the objectivity and honesty of the judiciary was called into question, and the British anti-slavery movement was galvanized. The British Court of the Queen's Bench quickly issued a writ of habeas corpus and a new Anderson trial was planned in London. Interference in Canadian administration of justice was prevented only by a decision in the Court of Common Pleas that the warrant to arrest Anderson had been defective. Anderson was released to ultimately settle in Liberia, the integrity of the Canadian judicial system was secured, and Ontario and Toronto took some comfort in having taken its stand on one of the great issues of the age.